They say that eyes are the windows to your soul. At the very least, they're often the first thing people look at on your face, as they have a tale to tell about your lifestyle, your age and even your overall health. Eyes that look tired or have bags under them indicate a lack of sleep, age and stress. Fine lines and wrinkles can make you look years older than you are, as the delicate skin surrounding your eyes is usually the first to to give up those tell-tale markers of age, and it's not uncommon for women to start to see them as early as their mid-twenties. In short, it's important for you to take care of your peepers. Well rested eyes indicate vitality, health and youth. There are several things you can do to make sure you're putting your best eyes on display when you leave the house each day. The skin around our eyes is some of the thinnest, most delicate on the body. It needs to be treated with care, but it also needs to stay clean and smooth. 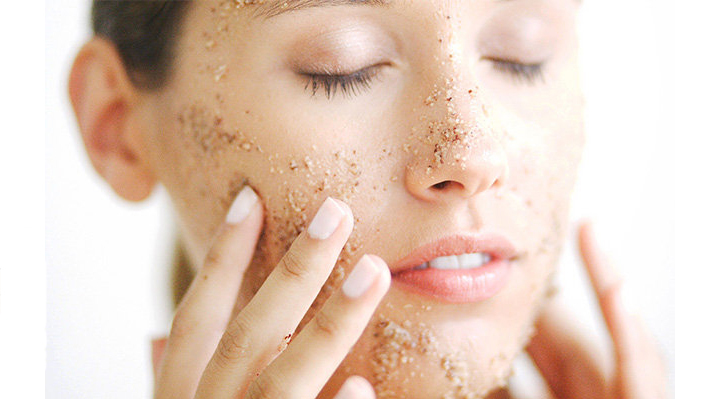 Exfoliation removes dead skin cells and encourages the regeneration of new ones. Your eyes will look brighter and the area around them will feel fresher and look younger. 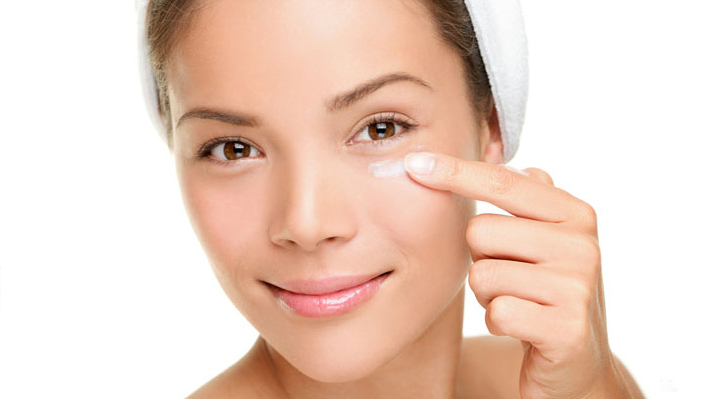 One quick, easy and inexpensive way to exfoliate the eyes is to use baking soda. Simply pour a little into the palm of your hand, mix in some water, stir with your finger into a paste, then use your ring finger (which has a natural delicate touch) to gently massage some of the paste into the area around your eye. Be careful not to get the paste into the eye itself, just slowly rub around the eye area in regular, circular motions, then wash clean. You can also use baking soda paste on your whole face - it's a fantastic, effective and inexpensive natural exfoliator. 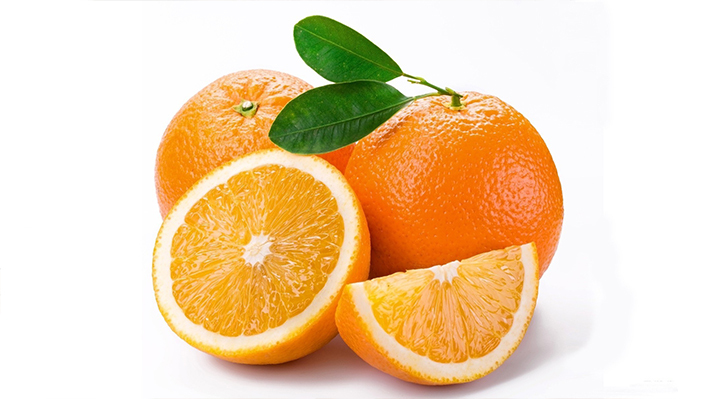 Once you've exfoliated, you should then apply a serum which contains a healthy dose of Vitamin C. Also called ascorbic acid, you've probably heard about it in relation to oranges and other citrus fruit, but it has many health benefits and is an effective anti-aging vitamin which is also packed full of antioxidants. Vitamin C helps the body to maintain healthy connective tissue, which is why it can play such a vital role in keeping your delicate eye area strong and smooth. There's only one type of Vitamin C which can be absorbed by the skin (so forget about just rubbing oranges around your eyes!) so make sure your serum contains this. Use Vitamin C serum after exfoliation and before you use any other product on the same area - the serum needs time to absorb and work its magic before you apply anything else. 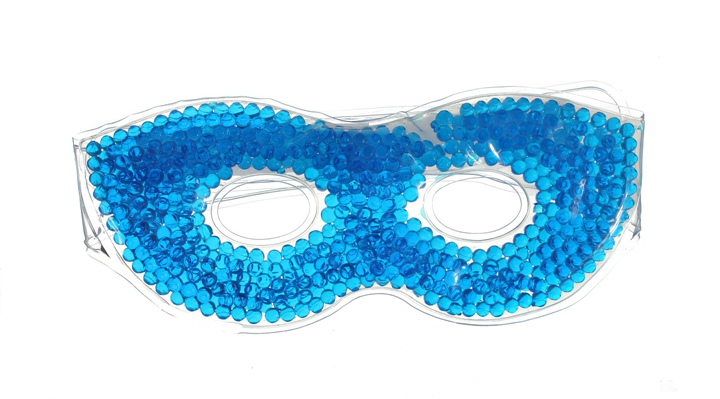 Eye Masks can do amazing things in the short and long term for the look and feel of your eyes. Some of them help to de-puff in 20 minutes or less for that big date night. While others provide soothing benefits that will make you as sleepy and relaxed as a newborn babe. Many of them include extra ingredients that help to combat fine lines and wrinkles too. They can hydrate your skin and reduce dark circles as well. Usually you put them on for 10 to 20 minutes at a time, a few times per week as part of your maintenance beauty routine. Try the Bliss Triple Oxygen Energizing Eye Mask; it helps to brighten, de-puff and de-line under eyes in one easy step. There are so many eye masks on the market, there's sure to be one that fits your needs personally. This is one occasion when a bit of Internet research will do you and your eyes some good. Eye masks that come in a cream or gel-based liquid applied to your eye area provide moisture, puffiness reduction and de-wrinkle benefits. But they aren't the only gel mask option. Some gels are enclosed in a thin, flexible, plastic that's re-usable, portable and can be utilized either hot or cold. The latter type is good to include in any travel kit and isn't a bad idea to keep at home. In today's busy world, work stress and staring at a computer for several hours per day can really do a number on your eyes. Not only does repeated squinting (no matter how slight) cause wrinkles, but the strain can cause bloodshot whites, puffiness and dark circles. Those that regularly use a warm eye mask before they go to bed at night notice they have brighter, more alert and younger looking eyes during the day. Not to mention, a warm gel mask feels good on and helps to reduce tension headaches as well. An eye mask left in the refrigerator or freezer and applied to your eyes works wonders in hot weather and constricts blood vessels, reducing visible signs of eye strain too. At the end of the day, it's your preference (literally). Think of eye moisturizer as a preventative, daily, must-have that will combat eye aging signs over time. It's not a highly concentrated serum that gives you a quick fix. Instead it needs to be used regularly, preferably before you start to see really obvious fine lines or wrinkles. Here's why: as your skin ages, the oil-producing glands underneath the surface produce less oil. This means your skin starts to dry out and any lines that have begun to form will be more obvious. A gel and a cream are both available, to produce young-looking results. Those who prefer a richer, thick feel will want the cream while those who live in a warmer climate and enjoy the fluidity of gel might choose the gel. Eyelashes, as you well know, are hair and as such are made of the same dead protein as the stuff growing out of your scalp. That means your eyelashes are prone to thinning and drying out as you age, just like the stuff growing out of your scalp. To keep your eyelashes healthy, moisturized and prevent breakage apply eyelash conditioner on its own or before you apply your mascara. 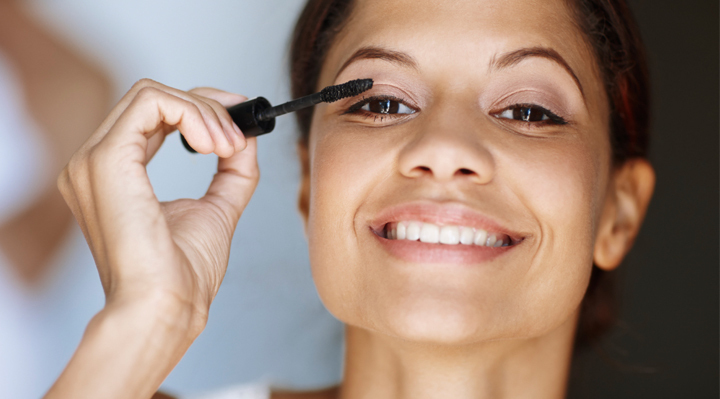 One bonus of repeated use is that you may be able to ditch your mascara altogether and have eyelashes that are thick, healthy and strong all by themselves. One conditioner on the market is called Jane Iredale Purelash Extender & Conditioner. It provides unbelievable lashes. As a primer before mascara it provides thickness, strength and length so that your mascara is as effective as possible. It also moisturizes your lashes and may aid in growth. These are amazing little things which really work but, as with all health and fitness routines, you need to keep at it to see the long-term results. So just set aside one hour a day, preferably in the evening when your day is nearly done and, after washing your face, apply these pads and just relax in front of the TV or with a good book. They work in a number of ways. Firstly, the placement of the pads means that the skin underneath cannot crease while they're there. Secondly, silicon creates moisture, which irons out wrinkles and creases, and boosts healthy regeneration of skin cells. Finally, silicon stimulates collagen production, and collagen is what gives your skin that gorgeously smooth, soft glow. Relaxation is the key, so you don't sweat and cause the pads to slip off your face. You should literally see the difference around your eyes after just a couple of days' use, and the longer you can keep the pads on, the better - you can even sleep in them! Just make sure your bedroom is cool so you won't overheat during the night and make the pads slide off your face. This is a surgery/injection-free way of pepping up your eyes and making you look instantly younger, so what's not to like? Put them on your face before going out for the night as you will see instant results that will last throughout the night! Wrinkles occur for two main reasons - dehydration and exposure to UV radiation via the sun or even just daylight, which causes the breakdown of the skin's connective tissue. Collagen helps these tissues stay elastic and strong, but collagen production decreases the older we get. A great way to combat both wrinkles and dehydration is to use olive oil; a natural remedy which is great for so many other things, too - as a moisturizer, for healthy cooking, and also as a scar reducer. Olive oil is inexpensive, economical and contains no harmful chemicals, so next time you're perusing all those expensive anti-aging creams in the drugstore, consider this alternative, which is proven to be more effective anyway. 1. 'Pat' the oil in dabs with your fingertips, starting at the outer edge of the eye and working your way underneath towards your nose, then back out again. Don't pull at the skin and rub it, just pat-pat-pat along the underside of the eye, to the nose and back to the edge of your cheek. Once you've done this a few times, you can then gently slide your finger along the dots of oil, back and forth, until the oil begins to absorb. Leave for 10 minutes and then blot the area with a soft tissue or cotton pad. 2. 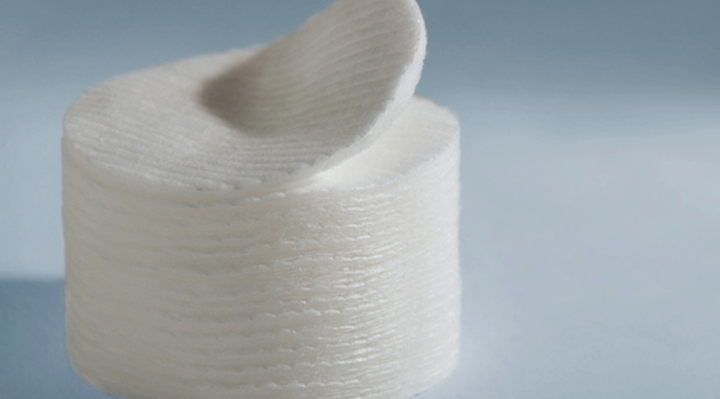 Fold or cut in half two cotton pads and soak them in the oil. Place them on the wrinkled areas (but not over the eyelid) and lie back and relax for 20 minutes, then remove. This is a great way to just chill out after a hard day - put some of your favorite relaxing music on, light an incense burner and just wind down. Warming the oil beforehand can help absorbency and also soften your skin further - just run the bottom of the jar or bowl under hot running water for a minute (never use a microwave as this changes the molecular structure of the oil.) And remember, although olive oil itself is not harmful to the eyeball, essential oils are, so avoid getting the mixture into the eye if you're using added oils. What looks like shadows under the eyes are actually leaking blood vessels which are spreading blood to the surface of the delicate, thin skin under the eye area. This can be caused by excess rubbing (see 'Red Eye' above) or a pooling of blood in the vessels in the head when you do things like sleep on your stomach (causing blood to accumulate in the top half of your body.) Dark circles can also be a symptom of a liver disorder, so if the remedies here do not work, it might be worth getting checked out by your doctor. One way to combat dark circles is to use a mixture of rose water and cold milk. Simply mix the two together and soak a cotton ball which you then place upon your under-eyes. Lie back for 10 minutes, then pat dry. Do this every day and you will notice a significant change in a few weeks. Why does this work? Because rose water is filled with antioxidants, is a natural antiseptic and antibacterial agent, and it also soothes the skin, which prevents the tiny blood vessels around the eyes from breaking. The cold milk is a natural alkali which can neutralize the acidity in your skin and also reduces the chance of capillaries weakening and breaking. * Gently massage extra virgin coconut oil around the eye area before you go to bed. Using clockwise and anticlockwise rotations, pay attention to the whole area, not just under your eyes. Once semi-absorbed, go to sleep as normal and wash the oil away in the morning (just splash with lukewarm water or cleanse your face in the shower.) You can also add a few drops of almond oil, or another essential oil like sandalwood, macadamia or grape seed, all of which have soothing properties to help get the circulation going and prevent pooling. * Add a quarter teaspoon of turmeric to some coconut oil in a bowl. Mix into a paste then apply under the eyes and leave for 10 minutes. The turmeric helps stimulate blood flow around the eyes which makes the eye area brighter and less inclined to pool. For a more intense treatment, mix 1 teaspoon of coconut oil with 2 teaspoons of turmeric powder, 2 tablespoons of chickpea flour, a teaspoon of whole milk and half a teaspoon of honey with a drop of lemon juice. Mix into a paste and apply to the eye area, allowing it to dry (about 20 minutes) before washing off. 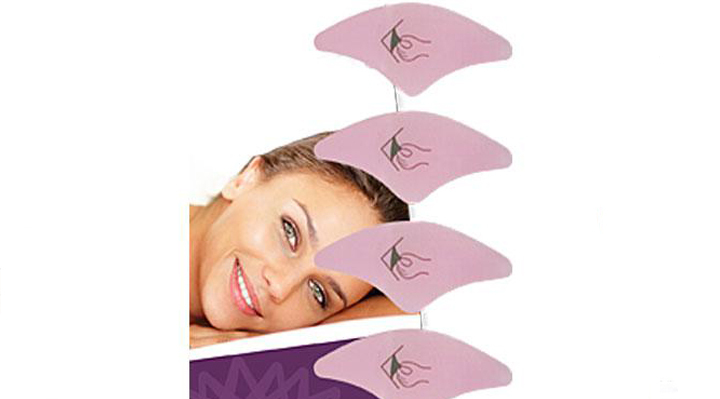 This 'eye mask' will penetrate deep into the skin and remove dead cells as well as increase blood flow, and your dark circles should disappear after a couple of weeks. Be warned, turmeric stains everything it comes into contact with, so keep it away from fabrics. * Mix up some grated potato and grated cucumber in a bowl and apply the mixture to your eye area, leaving for 20 minutes or until dry. Wash off with cold water then apply some melted coconut oil to the same area. Leave overnight and wash off in morning. Potato is a well-known bleaching agent, which will eradicate dark circles. Cucumber is a natural soother, keeping the skin fresh and tight. Rubbing in the coconut oil afterwards help your skin retain the benefits of the potato and cucumber, 'locking' the two into your skin as it replenishes overnight. 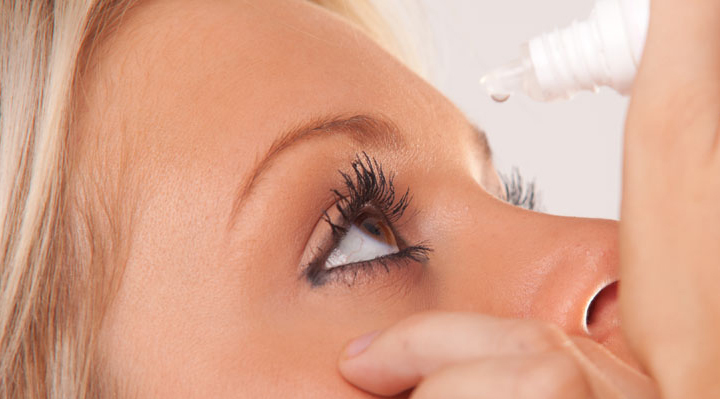 Dry eyes are caused by several things, such as dehydration, strain from overuse, blocked or under-performing tear ducts, nutrient deficiency and the side effects of certain medications. A lack of Vitamins A and D is also a major cause of dry eyes, which is why coconut oil, again, can be so effective in combating the irritation. Simply melt some coconut oil into a small bowl and use an eye dropper (easily bought from drugstores) to lift the oil from the bowl and administer 3 or 4 drops into your eyes. Everything will go blurry for a minute or so, but that will soon clear as the oil stimulates the tear ducts and your eyes become moist again. After you've done this a few times a week for a month or so, your eyes should return to a normal moistness level. Always remember to stay hydrated too, as dry and itchy eyes are often a sign of being dehydrated. That doesn't mean just drinking water, it means including the proper nutrients in your diet, too, so make sure you're getting enough fresh fruit and green veg, and you'll soon find that everything from dark circles and red, dry eyes, disappear within weeks. Puffy eyes are caused by many of the same things as dark circles and dry, itchy eyes - bad circulation, dehydration, fatigue and a lack of essential vitamins. Infections can also cause puffy eyes, so do visit a doctor if you feel lumps or a specific irritation or soreness on a particular area. If your eyes are generally swollen or feel tired, heavy and dull, then there are lots of natural ways to lift them and return them to a fresh, invigorated state. Make sure to check out my eye massages below, which can help with puffy eyes. 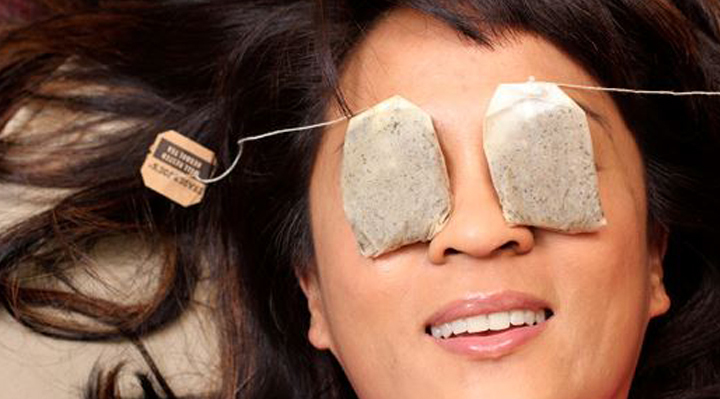 Cold compresses using black or green tea bags are great for reducing eye swelling. This is because the tea contains caffeine and tannins which naturally constrict the blood vessels, tightening the skin and reducing swelling. Strawberries contain something called alpha-hydroxy acid (AHA) which is a natural exfoliant and also a great astringent, helping to tighten skin and reduce puffiness. Make sure the strawberries are cold before you slice them, to avoid excess juice running into the eyes, which can sting. Cucumbers are one of nature's best-known skin soothers and antiseptics, which is why they're a common ingredient in many face masks, skincare lotions and moisturizers. 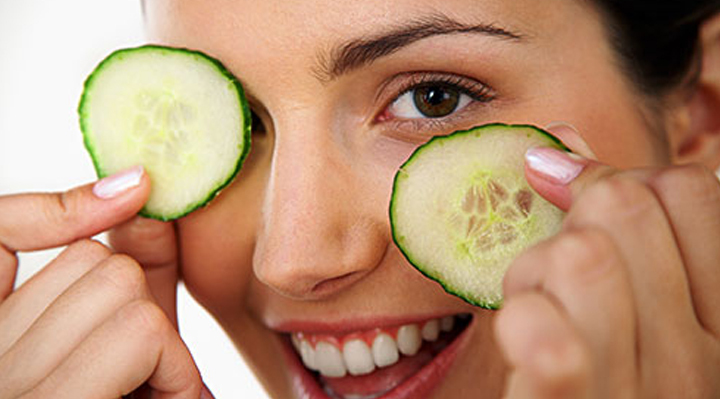 Simply place some sliced cucumber over your eyes for 20 minutes, and you'll immediately feel your eyes relax and become less puffy and swollen. Our skincare routines will usually involve using tissues, wipes or cotton balls and pads to apply and remove products, but sometimes these materials can damage our eyes because we're not aware of what's actually in them. Many cotton pads and cotton balls, for instance, contain bleaching chemicals which make the cotton appear whiter than normal. They also contain other chemicals which bind the cotton polymers together, but which some people are allergic to. So make sure your cloths, wipes and/or cotton pads are 100% organic, such as these MUJI Makeup Facial Soft Cut Cotton Unbleached Squares. They're SO supersoft, chemical-free and large enough to cover the whole face so there's no waste. You can cut them to size, too, so they're ideal for using around the delicate eye area to wipe off makeup and use as eye masks. Sounds obvious, right? But there's a reason why we're always being told to hydrate! hydrate! hydrate! Water is essential to everything our body does and it's responsible for the way our bodies look, too. When you're dehydrated your skin loses color and pallor, it wrinkles faster, it sags quicker and your eyes, especially, will be unable to stay moist enough to keep themselves clean and clear. 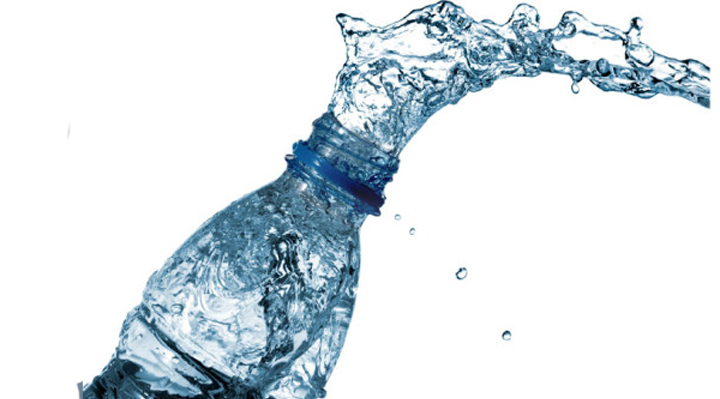 Water provides essential nutrients, not just to the skin around the eyes, but also to the eyes themselves. Being dehydrated puts you at risk of eye infections, styes, puffiness and dryness, all because your tear ducts will not be able to function properly if there's no water to 'feed' them. So make sure to drink at least 8 glasses of water per day, and keep your diet boosted with water-filled foods such as watermelon. Another easy way to maintain gorgeous eyes, is to make sure you get enough zzz's. Sleeping is your body's way of re-energizing and renewing itself, it's a temporary coma where your brain gets to concentrate on healing without the distractions of your waking life. If you're not getting enough sleep, then your body has no time to fix itself, and that will result in puffy, blood shot, tired eyes. Great sleep equals bright, beautiful eyes, it really is that simple. One of the greatest enemies to our eyes is UV radiation, but many people think that only direct sunlight can harm us, so they only wear sunglasses on sunny days. But even normal daylight contains sufficiently harmful levels of UV radiation to damage our eyes, so it makes sense to get into the habit of wearing sunglasses whenever you go out during the day. UV radiation also ages your skin rapidly, plus there are the obvious health risks associated with skin cancer. This isn't to panic you, but it's just basic common sense to protect both your skin and your eyes whenever you're exposed to the sun. OK, so you don't have to slap on the sunscreen every time you go to the shops on a dull day but, where the eyes are concerned, there's a sensible logic to wearing sunglasses outdoors, even if it's overcast. Radiation isn't obstructed by things like clouds, so protect your eyes the same way as you would in direct sunlight. And when purchasing sunglasses, check that they actually protect you from UV radiation - it's surprising the number of expensive, branded sunglasses which don't contain even the most basic UV filters. 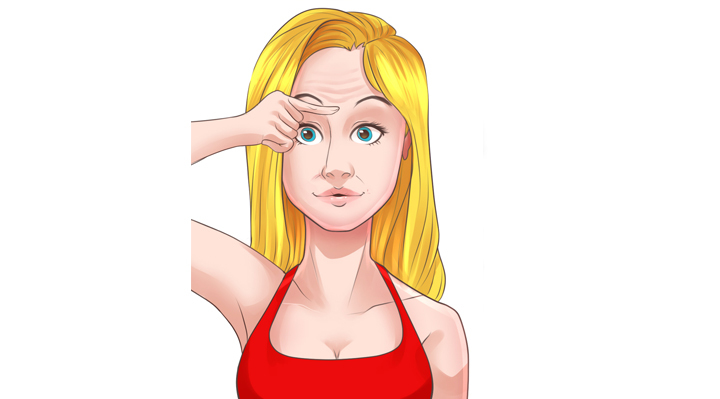 I know what you're thinking - Botox means having expensive and painful injections to eradicate wrinkles around the eyes and forehead, and it's only something older or rich people do. But Botox has come a long way since the 1990s and, if it makes you look younger and helps you feel more confident, then why not? 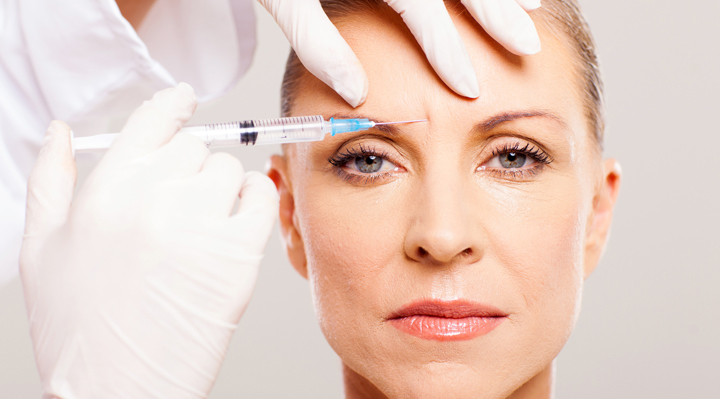 Botox is actually best used by younger people anyway, as it can help smooth the skin in preparation for aging so that, further down the line, you won't actually need any more treatment because your skin will have settled into its natural aging groove. Prevention is key when it comes to aging. Botox is a protein which, when injected, paralyzes the facial muscles and prevents wrinkles from appearing in the treated area. Even after your first injection, it will only take a week for you to notice the radical changes. Botox does not guarantee wrinkle-free skin for the rest of your days but, if you start treatments sooner rather than later, then you won't be susceptible to natural-age wrinkles because your skin will already be immune to them. 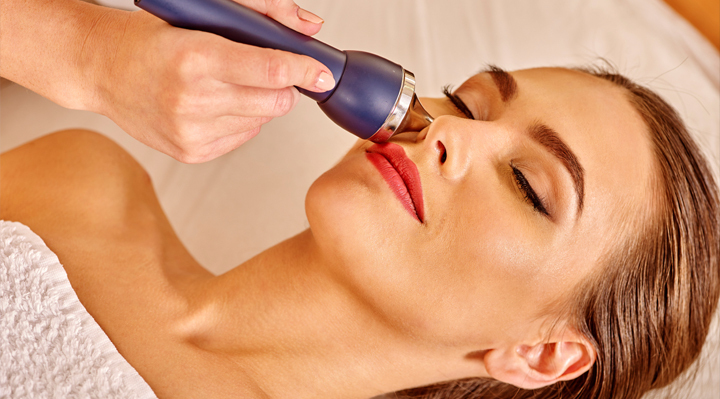 Microdermabrasion is when a skin specialist 'sands' the skin to remove the top layer, or layers, of skin cells, resulting in brighter skin and an increase in blood flow, constricting the blood vessels and boosting the color and glow of your skin. 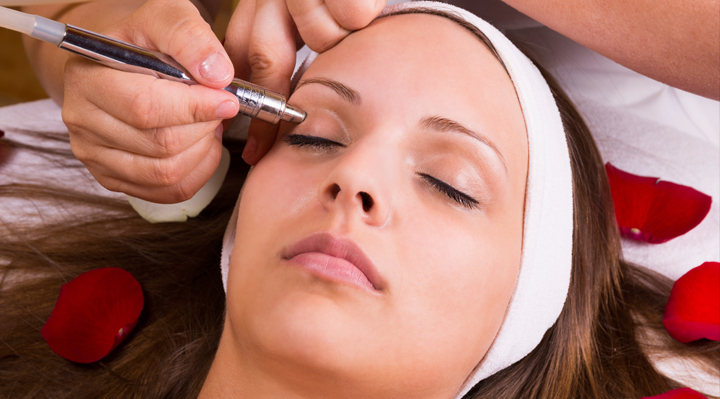 Microdermabrasion is a lot gentler than dermabrasion (which is commonly used to treat aggressive skin conditions like acne, scar, pox marks and diseases,) and it can be done quickly and easily either at home or in a specialist spa. Tiny crystals are sprayed onto the skin which exfoliate and massage the skin, before being washed away. Unlike dermabrasion, there is no numbing required and 'recovery' time is minimal - your skin may appear pink and flushed for a few hours afterwards, but no more than if you'd just had a session in the steam room or sauna. Dermal fillers work by filling the troughs and valleys caused by wrinkles and dark circles, smoothing out the skin and preventing new wrinkles from appearing. Think about when an air bed becomes slightly deflated and crinkles form on the top. Injecting more air flattens out those crinkles so the air bed looks plumped up once more. It's the same with dermal fillers, except it's not air being pumped into the skin, but a special filling agent (similar to Botox) called hyaluronic acid, often marketed under the brand name Restylane. It's an intense procedure, so research your practitioner carefully. You'll need a local anesthetic administered but the effects last for anything up to 3 years. 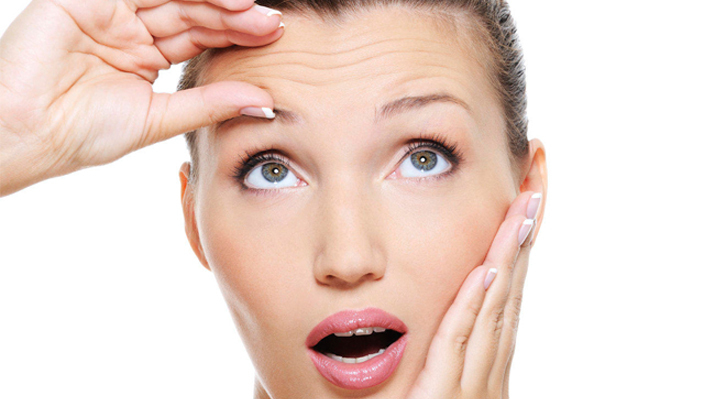 Laser resurfacing is an increasingly popular method of fighting eye wrinkles. It works by vaporizing the water molecules both inside and outside skin cells, which damages the skin tissue, forcing the body to create more collagen to 'fix' the tissue, thus smoothing out the skin and making it more elastic. It can also lighten the skin, so it can help combat dark circles, too. 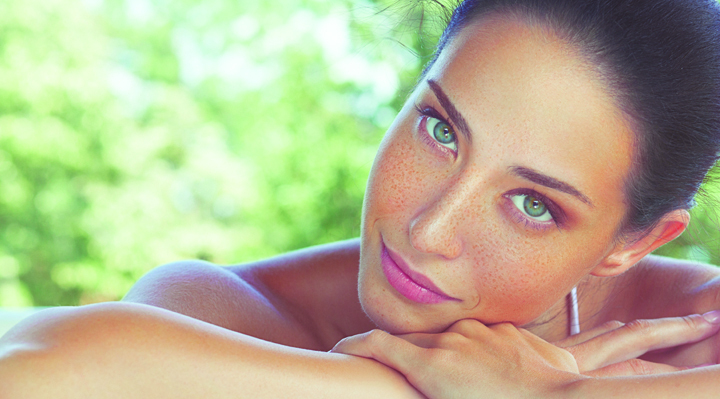 Studies have shown that wrinkles are improved by around 45% through laser resurfacing surgery. Sometimes, only one treatment is needed to treat eye wrinkles, while others will need 2-4 treatments, with sessions lasting approximately 30 minutes. Lasers can also be used to treat sight problems, which means you'd no longer have to wear contact lenses - a common contributor to red and dry eyes. Getting into the habit of massaging your eyes every day means you'll soon see the benefits. You'll see brighter eyes and a significant reduction in wrinkles and dark circles, and the best thing is that it doesn't have to take much time, or cost any money, so there's no excuse not to do it. * Place each thumb and forefinger either side of the inner eyebrows and gently pinch the brows between your fingers. Don't 'squeeze,' just gently pinch. * Move the fingers along the line of the brow, pinching as you go. * At the end of the eyebrow, press gently into the temple, then go back along the brow, continuing to pinch. This will get the blood flowing ready for the massages. * Dip your ring fingers in either some organic eye cream or coconut oil. * Starting from the outer edge of the under-eyes, work your fingers in circular motions, heading in towards your nose and out again. * Do this 10 times, or until the cream/oil is absorbed. * To end, 'dab' at the same areas with your ring fingers, which will get the circulation going and freshen up the eye area. * Press your fingertips into your forehead, with most pressure being on the middle fingers. * Pull your fingers out to the side of your head, as though 'drawing' lines across each side your forehead. * Move your fingers down to your eyebrows and, beginning from the center, at the top of your nose, use your fingers to trace the natural top border of your eyebrows, out to the temple, then back in again, and out again. * Next, press your fingertips gently against the sides of your eyes, where the crow's feet usually live. Slide them gently under your eyes towards your nose, then back again to your temples, tracing the outline of your lower eye. Do not 'drag' your fingers or pull at the delicate skin, simply press gently as you draw the shape of your lower eyelids. * Place your fingers at the top of your nose by the inside corner of each eye. Slide the fingers down the sides of your nose until you reach the nostrils, sweep the fingers across your cheekbones and up to your temple then back under your eyes to the top of the nose again and repeat. * Place your thumbs underneath your eyebrows and your forefingers above the eyebrows, so you're effectively 'pinching' your eyebrows. * Push down with your brow muscles, focusing on the inner corner of your eyes. * Draw your fingers outwards towards your temples while still pushing down with your eyebrow muscles. * Hold the position for around 10 seconds. * This exercise strengthens the area above your nose and between your brows, reducing the chances of vertical lines appearing. * Place your thumbs on your temples and your forefingers underneath the arch of each eyebrow. * Push down with your eyebrows at the same time as raising them with your fingers. 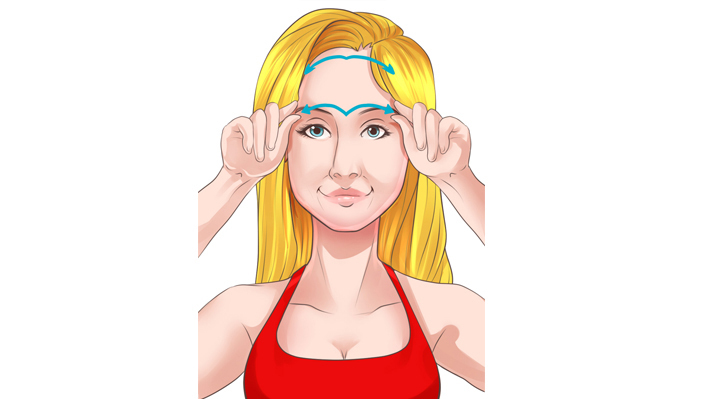 The natural resistance created will strengthen the upper eyelid muscles and lift the brow. * Hold the resistance position for 10 seconds, then relax and repeat 3 times. * Hold your middle and ring fingers together and place them at the outer edge of each eye. * Squint your eyes and feel the resistance as you keep the corners in place with your fingers. * Squint, hold and release for 10 reps, then rest for a few seconds before repeating. * This exercise strengthens the eyelid muscles which will help eradicate existing wrinkles and prevent new ones from forming. * Using your muscles alone, 'lift' the inner corners of your eyes, feeling the pull on the brow. * Hold the upwards look for 2 seconds, then release and repeat up to 10 times. 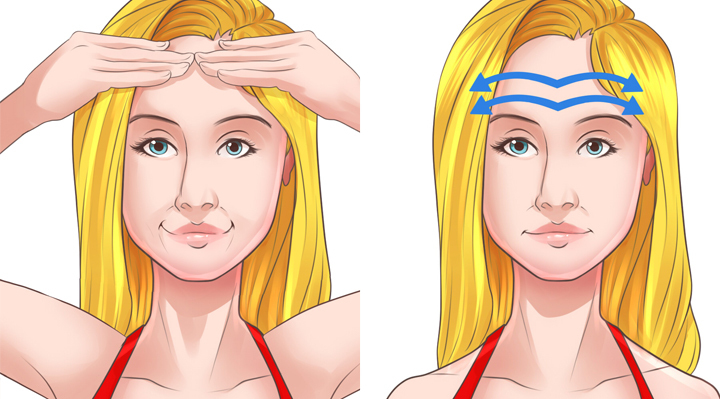 * This exercise can help get rid of wrinkles around the eyes and will help prevent new ones. * Using your middle three fingers, parallel together, push with the fingertips in the space above the nose, between the brows. * Press down and hold for 5 seconds. * Release then repeat for 3-5 times. * This exercise will help massage and strengthen the facial muscles at the top of your nose and prevent vertical lines from forming. * Hold your middle and ring fingers together and place them at the outer corners of your eyes just underneath the lower lids. * Try to close your eyes using the lower lids only - the easiest way to do this is focus on the inner corners of your eyes or look up as you try and close the eyes. * Feel the 'pull' from the lower lids. * Do this 10 times in short bursts. * Relax then repeat 3 more times. * This exercise stretches and tones the muscles in the outer corners of your eyes, making the skin smoother and less susceptible to wrinkling. * Open and close your eyes in a regular rhythm. * As you go, increase the pressure with which you are closing your eyes, pressing the eyelids together. Hold the closed eyelids for 5 seconds before releasing each time. * You will feel slight vibrations as you do this, but resist the natural urge to blink. Instead, just focus on the muscles working the corners of your eye. * This exercise firms up the eyelids and exercises the eye muscles. * Look straight ahead into a mirror, making sure your reflection is level. * Open your eyes as wide as they will go but make sure the rest of your facial muscles are relaxed. * Imagine you can touch your upper eyelids with your upper eyelashes. * Keep your eyes widened for as long as is comfortable. * Relax after every attempt, then repeat up to 10 times. 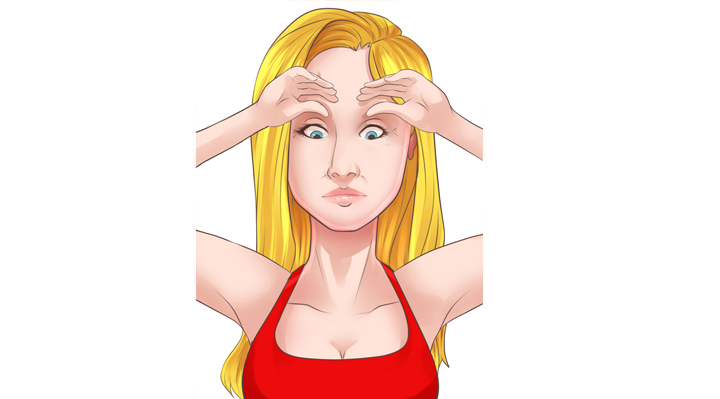 * This exercise helps prevent sagging eyelids. Remember, only move the eyelids, not the eyeballs. * Relax all your facial muscles. 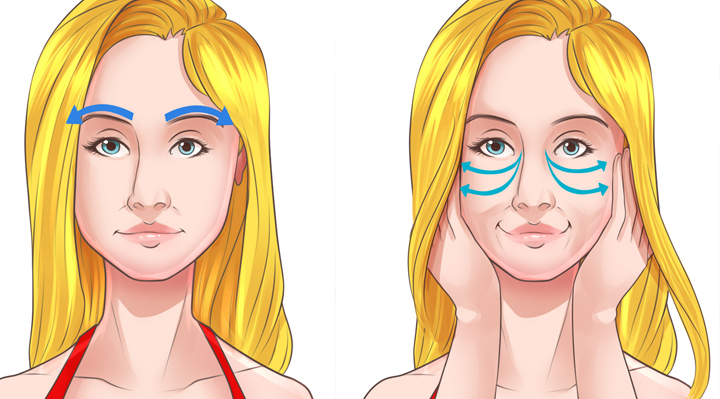 * Place your middle finger flat on the space between your brows, directly above your nose. * Raise your eyebrows as high as they will naturally go - you will feel the pinch of the muscle underneath your finger. * Relax again then repeat, each time feeling the muscle contract with your finger. * This exercise helps release muscle tension and keeps that area of skin strong and elastic, thus reducing the appearance of vertical lines.